This week I’m reading my way through three biographies, which neatly capture the work of three key scientists who laid the foundation for modern climate modeling: Arrhenius, Bjerknes and Callendar. Crawford, E. (1996). Arrhenius: From Ionic Theory to the Greenhouse Effect. Science History Publications. A biography of Svante Arrhenius, the Swedish scientist who, in 1895, created the first computational climate model, and spent almost a full year calculating by hand the likely temperature changes across the planet for increased and decreased levels of carbon dioxide. The term “greenhouse effect” hadn’t been coined back then, and Arrhenius was more interested in the question of whether the ice ages might have been caused by reduced levels of CO2. But nevertheless, his model was a remarkably good first attempt, and produced the first quantitative estimate of the warming expected from human’s ongoing use of fossil fuels. Friedman, R. M. (1993). 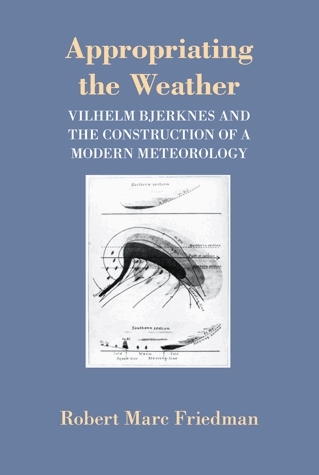 Appropriating the Weather: Vilhelm Bjerknes and the Construction of a Modern Meteorology. Cornell University Press. A biography of Vilhelm Bjerknes, the Norwegian scientist, who, in 1904, identified the primitive equations, a set of differential equations that form the basis of modern computational weather forecasting and climate models. The equations are, in essence, an adaption of the equations of fluid flow and thermodynamics, adapted to represent the atmosphere as a fluid on a rotating sphere in a gravitational field. At the time, the equations were little more than a theoretical exercise, and we had to wait half a century for the early digital computers, before it became possible to use them for quantitative weather forecasting. Fleming, J. R. (2009). The Callendar Effect: The Life and Work of Guy Stewart Callendar (1898-1964). University of Chicago Press. 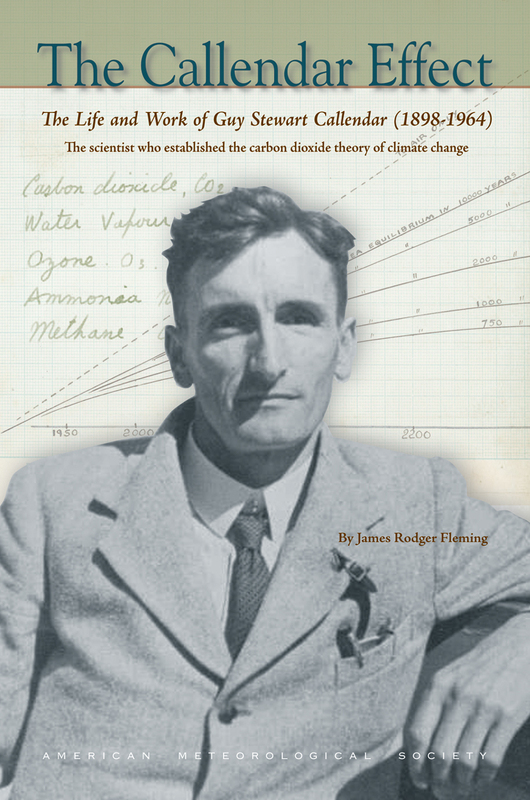 A biography of Guy S. Callendar, the British scientist, who, in 1938, first compared long term observations of temperatures with measurements of rising carbon dioxide in the atmosphere, to demonstrate a warming trend as predicted by Arrhenius’ theory. It was several decades before his work was taken seriously by the scientific community. Some now argue that we should use the term “Callendar Effect” to describe the warming from increased emissions of carbon dioxide, because the term “greenhouse effect” is too confusing – greenhouse gases were keeping the planet warm long before we started adding more, and anyway, the analogy with the way that glass traps heat in a greenhouse is a little inaccurate. Not only do the three form a neat ABC, they also represent the three crucial elements you need for modern climate modelling: a theoretical framework to determine which physical processes are likely to matter, a set of detailed equations that allow you to quantify the effects, and comparison with observations as a first step in validating the calculations. It’s been a while since I’ve written about the question of climate model validation, but I regularly get asked about it when I talk about the work I’ve been doing studying how climate models are developed. There’s an upcoming conference organized by the Rotman Institute of Philosophy, in London, Ontario, on Knowledge and Models in Climate Science, at which many of my favourite thinkers on this topic will be speaking. So I thought it was a good time to get philosophical about this again, and define some terms that I think help frame the discussion (at least in the way I see it!). Discussion of validity of scientific computational models tend to treat “the model” as a unitary artifact, and ask questions about its fidelity with respect to observational data, and its predictive power with respect to future situations. For climate modeling, both of these questions are problematic, because of long timescales and inhomogeneities in the available data. Our ethnographic studies of the day-to-day practices of climate modelers suggest an alternative framework for model validity, focusing on a modeling system rather than any individual model. 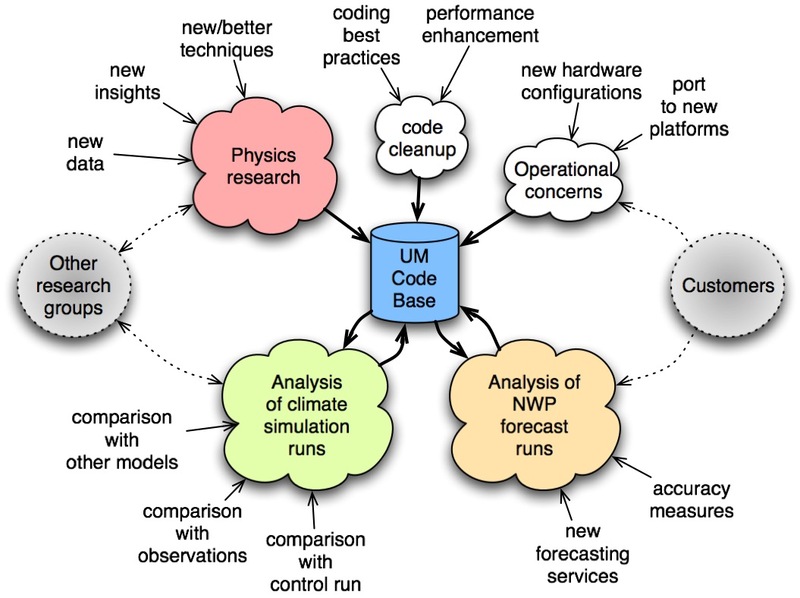 Any given climate model can be configured for a huge variety of different simulation runs, and only ever represents a single instance of a continually evolving body of program code. Furthermore, its execution is always embedded in a broader social system of scientific collaboration which selects suitable model configurations for specific experiments, and interprets the results of the simulations within the broader context of the current body of theory about earth system processes. We propose that the validity of a climate modeling system should be assessed with respect to two criteria: Constructive Validity, which refers to the extent to which the day-to-day practices of climate model construction involve the continual testing of hypotheses about the ways in which earth system processes are coded into the models, and External Validity, which refers to the appropriateness of claims about how well model outputs ought to correspond to past or future states of the observed climate system. For example, a typical feature of the day-to-day practice of climate model construction is the incremental improvement of the representation of specific earth system processes in the program code, via a series of hypothesis-testing experiments. Each experiment begins with a hypothesis (drawn from current or emerging theories about the earth system) that a particular change to the model code ought to result in a predicable change to the climatology produced by various runs of the model. Such a hypothesis is then tested empirically, using the current version of the model as a control, and the modified version of the model as the experimental case. Such experiments are then replicated for various configurations of the model, and results are evaluated in a peer review process via the scientific working groups who are responsible for steering the ongoing model development effort. Assessment of constructive validity for a modeling system would take account of how well the day-to-day practices in a climate modeling laboratory adhere to rigorous standards for such experiments, and how well they routinely test the assumptions that are built into the model in this way. Similarly, assessment of the external validity of the modeling system would take account of how well knowledge of the strengths and weaknesses of particular instances of the model are taken into account when making claims about the scope of applicability of model results. We argue that such an approach offers a more coherent approach to questions of model validity, as it corresponds more directly with the way in which climate models are developed and used. Lots of interesting insights from the 2009 AGU session on “How good are the predictions from climate models“. A much longer essay on Validating Climate Models, which provides more background to my thinking on this. Imagine for a moment if Microsoft had 24 competitors around the world, each building their own version of Microsoft Word. Imagine further that every few years, they all agreed to run their software through the same set of very demanding tests of what a word processor ought to be able to do in a large variety of different conditions. And imagine that all these competing companies agreed that all the results from these tests would be freely available on the web, for anyone to see. Then, people who want to use a word processor can explore the data and decide for themselves which one best serves their purpose. People who have concerns about the reliability of word processors can analyze the strengths and weaknesses of each company’s software. Then think about what such a process would do to the reliability of word processors. Wouldn’t that be a great world to live in? Well, that’s what climate modellers do, through a series of model inter-comparison projects. There are around 25 major climate modelling labs around the world developing fully integrated global climate models, and hundreds of smaller labs building specialized models of specific components of the earth system. The fully integrated models are compared in detail every few years through the Coupled Model Intercomparison Projects. And there are many other model inter-comparison projects for various specialist communities within climate science. Have a look at how this process works, via this short paper on the planning process for CMIP6. Detailed projections of future climate change are created using sophisticated computational models that simulate the physical dynamics of the atmosphere and oceans and their interaction with chemical and biological processes around the globe. These models have evolved over the last 60 years, along with scientists’ understanding of the climate system. This course provides an introduction to the computational techniques used in constructing global climate models, the engineering challenges in coupling and testing models of disparate earth system processes, and the scaling challenges involved in exploiting peta-scale computing architectures. The course will also provide a historical perspective on climate modelling, from the early ENIAC weather simulations created by von Neumann and Charney, through to today’s Earth System Models, and the role that these models play in the scientific assessments of the UN’s Intergovernmental Panel on Climate Change (IPCC). The course will also address the philosophical issues raised by the role of computational modelling in the discovery of scientific knowledge, the measurement of uncertainty, and a variety of techniques for model validation. Additional topics, based on interest, may include the use of multi-model ensembles for probabilistic forecasting, data assimilation techniques, and the use of models for re-analysis. History of climate and weather modelling. Early climate science. Quick tour of range of current models. Overview of what we knew about climate change before computational modeling was possible. Lynch, P. (2008). The origins of computer weather prediction and climate modeling. Journal of Computational Physics, 227(7), 3431-3444. Weart, S. (2010). The development of general circulation models of climate. Studies In History and Philosophy of Science Part B: Studies In History and Philosophy of Modern Physics, 41(3), 208-217. Platzman, G. W. (1979). The ENIAC Computations of 1950: Gateway to Numerical Weather Prediction. Bulletin of the American Meteorological Society, 60, 302-312. Staniforth, a, & Wood, N. (2008). Aspects of the dynamical core of a nonhydrostatic, deep-atmosphere, unified weather and climate-prediction model. Journal of Computational Physics, 227(7), 3445-3464. Liepert, B. G. (2010). The physical concept of climate forcing. Wiley Interdisciplinary Reviews: Climate Change, 1(6), 786-802. Rind, D. (1999). Complexity and Climate. Science, 284(5411), 105-107. Randall, D. A. (2011). The Evolution of Complexity In General Circulation Models. In L. Donner, W. Schubert, & R. Somerville (Eds. ), The Development of Atmospheric General Circulation Models: Complexity, Synthesis, and Computation. Cambridge University Press. Meadows, D. H. (2008). Chapter One: The Basics. Thinking In Systems: A Primer (pp. 11-34). Chelsea Green Publishing. Randers, J. (2012). The Real Message of Limits to Growth: A Plea for Forward-Looking Global Policy, 2, 102-105. Rockström, J., Steffen, W., Noone, K., Persson, Å., Chapin, F. S., Lambin, E., Lenton, T. M., et al. (2009). Planetary boundaries: exploring the safe operating space for humanity. Ecology and Society, 14(2), 32. Lenton, T. M., Held, H., Kriegler, E., Hall, J. W., Lucht, W., Rahmstorf, S., & Schellnhuber, H. J. (2008). Tipping elements in the Earth’s climate system. Proceedings of the National Academy of Sciences of the United States of America, 105(6), 1786-93. Typology of climate Models. Basic energy balance models. Adding a layered atmosphere. 3-D models. Coupling in other earth systems. Exploring dynamics of the socio-economic system. Other types of model: EMICS; IAMS. Müller, P. (2010). Constructing climate knowledge with computer models. Wiley Interdisciplinary Reviews: Climate Change. Weart, S. (2012). Simple Models of Climate Change. The Discovery of Global Warming. Gramelsberger, G. (2010). Conceiving processes in atmospheric models – General equations, subscale parameterizations, and “superparameterizations.” Studies In History and Philosophy of Science Part B: Studies In History and Philosophy of Modern Physics, 41(3), 233-241. Weber, S. L. (2010). The utility of Earth system Models of Intermediate Complexity (EMICs). Wiley Interdisciplinary Reviews: Climate Change, (April). Earth System Modeling. Using models to study interactions in the earth system. Overview of key systems (carbon cycle, hydrology, ice dynamics, biogeochemistry). Dahan, A. (2010). Putting the Earth System in a numerical box? The evolution from climate modeling toward global change. Studies In History and Philosophy of Science Part B: Studies In History and Philosophy of Modern Physics, 41(3), 282-292. Claussen, M. (2007). Climate system models – a brief introduction. Developments in Quaternary Science, 7, 495-497. Overcoming computational limits. Choice of grid resolution; grid geometry, online versus offline; regional models; ensembles of simpler models; perturbed ensembles. The challenge of very long simulations (e.g. for studying paleoclimate). Washington, W. M., Buja, L., & Craig, A. (2009). The computational future for climate and Earth system models: on the path to petaflop and beyond. Philosophical transactions. Series A, Mathematical, physical, and engineering sciences, 367(1890), 833-46. Slingo, J., Bates, K., Nikiforakis, N., Piggott, M., Roberts, M., Shaffrey, L., Stevens, I., et al. (2009). Developing the next-generation climate system models: challenges and achievements. Philosophical Transactions of the Royal Society A: Mathematical, Physical and Engineering Sciences, 367(1890), 815-31. Epistemic status of climate models. E.g. what does a future forecast actually mean? How are model runs interpreted? Relationship between model and theory. Reproducibility and open science. Shackley, S. (2001). Epistemic Lifestyles in Climate Change Modeling. In P. N. Edwards (Ed. ), Changing the Atmosphere: Expert Knowledge and Environmental Government (pp. 107-133). MIT Press. Sterman, J. D., Jr, E. R., & Oreskes, N. (1994). The Meaning of Models. Science, 264(5157), 329-331. Randall, D. A., & Wielicki, B. A. (1997). Measurement, Models, and Hypotheses in the Atmospheric Sciences. Bulletin of the American Meteorological Society, 78(3), 399-406. Smith, L. a. (2002). What might we learn from climate forecasts? Proceedings of the National Academy of Sciences of the United States of America, 99 Suppl 1, 2487-92. Assessing model skill – comparing models against observations, forecast validation, hindcasting. Validation of the entire modelling system. Problems of uncertainty in the data. Re-analysis, data assimilation. Model intercomparison projects. Oreskes, N. (2001). Philosophical Issues in Model Assessment. Model validation: Perspectives in. Oreskes, N., Shrader-Frechette, K., & Belitz, K. (1994). Verification, validation, and confirmation of numerical models in the earth sciences. Science, 263(5147), 641. Knutti, R. (2008). Should we believe model predictions of future climate change? Philosophical transactions. Series A, Mathematical, physical, and engineering sciences, 366(1885), 4647-64. Reichler, T., & Kim, J. (2008). How Well Do Coupled Models Simulate Today’s Climate? Bulletin of the American Meteorological Society, 89(3), 303-311. Shackley, S., Young, P., & Parkinson, S. (1998). Uncertainty, complexity and concepts of good science in climate change modelling: are GCMs the best tools? Climatic Change, 38, 159-205. Uncertainty. Three different types: initial state uncertainty, scenario uncertainty and structural uncertainty. How well are we doing? Assessing structural uncertainty in the models. How different are the models anyway? Masson, D., & Knutti, R. (2011). Climate model genealogy. Geophysical Research Letters, 38(8), 1-4. Pennell, C., & Reichler, T. (2011). On the Effective Number of Climate Models. Journal of Climate, 24(9), 2358-2367. Murphy, J. M., Sexton, D. M. H., Barnett, D., & Jones, G. S. (2004). Quantification of modelling uncertainties in a large ensemble of climate change simulations. Nature, 430(August 2004). Hawkins, E., & Sutton, R. (2009). The Potential to Narrow Uncertainty in Regional Climate Predictions. Bulletin of the American Meteorological Society, 90(8), 1095-1107. Hargreaves, J. C. (2010). Skill and uncertainty in climate models. Wiley Interdisciplinary Reviews: Climate Change, 1. Collins, M. (2007). Ensembles and probabilities: a new era in the prediction of climate change. Philosophical transactions. Series A, Mathematical, physical, and engineering sciences, 365(1857), 1957-70. Leutbecher, M., & Palmer, T. N. (2008). Ensemble forecasting. Journal of Computational Physics, 227(7), 3515-3539. The future. Projecting future climates. Role of modelling in the IPCC assessments. What policymakers want versus what they get. Demands for actionable science and regional, decadal forecasting. The idea of climate services. Taylor, K. E., Stouffer, R. J., & Meehl, G. A. (2011). A Summary of the CMIP5 Experiment Design. Moss, R. H., Edmonds, J. A., Hibbard, K. a, Manning, M. R., Rose, S. K., van Vuuren, D. P., Carter, T. R., et al. (2010). The next generation of scenarios for climate change research and assessment. Nature, 463(7282), 747-56. New, M., Liverman, D., Schroeder, H., Schroder, H., & Anderson, K. (2011). Four degrees and beyond: the potential for a global temperature increase of four degrees and its implications. Philosophical transactions. Series A, Mathematical, physical, and engineering sciences, 369(1934), 6-19. Agrawala, S., Broad, K., & Guston, D. H. (2001). Integrating Climate Forecasts and Societal Decision Making: Challenges to an Emergent Boundary Organization. Science, Technology & Human Values, 26(4), 454-477. Knowledge and wisdom. What the models tell us. Climate ethics. The politics of doubt. The understanding gap. Disconnect between our understanding of climate and our policy choices. Ramanathan, V., & Feng, Y. (2008). On avoiding dangerous anthropogenic interference with the climate system: Formidable challenges ahead. Proc. of the Nat. Acad. of Sciences, 105(38), 14245-14250. Stainforth, D. a., Allen, M. R., Tredger, E. R., & Smith, L. a. (2007). Confidence, uncertainty and decision-support relevance in climate predictions. Philosophical transactions. Series A, Mathematical, physical, and engineering sciences, 365(1857), 2145-61. Randalls, S. (2010). History of the 2°C climate target. Wiley Interdisciplinary Reviews: Climate Change, 1(4), 598-605. Hansen, J. E., Sato, M., Kharecha, P., Beerling, D. J., Berner, R., Masson-Delmotte, V., Pagani, M., et al. (2008). Target atmospheric CO2: Where should humanity aim? Open Atmospheric Science Journal, 2(15), 217-231. Turner, G. M. (2012). On the Cusp of Global Collapse? Gaia, 21(2), 116-124. Sterman, J. D., & Sweeney, L. B. (2002). Cloudy skies: assessing public understanding of global warming. System Dynamics Review, 18(2), 207-240. For a talk earlier this year, I put together a timeline of the history of climate modelling. I just updated it for my course, and now it’s up on Prezi, as a presentation you can watch and play with. Click the play button to follow the story, or just drag and zoom within the viewing pane to explore your own path. Consider this a first draft though – if there are key milestones I’ve missed out (or misrepresented!) let me know! In the talk I gave this week at the workshop on the CMIP5 experiments, I argued that we should do a better job of explaining how climate science works, especially the day-to-day business of working with models and data. I think we have a widespread problem that people outside of climate science have the wrong mental models about what a climate scientist does. As with any science, the day-to-day work might appear to be chaotic, with scientists dealing with the daily frustrations of working with large, messy datasets, having instruments and models not work the way they’re supposed to, and of course, the occasional mistake that you only discover after months of work. This doesn’t map onto the mental model that many non-scientists have of “how science should be done”, because the view presented in school, and in the media, is that science is about nicely packaged facts. In reality, it’s a messy process of frustrations, dead-end paths, and incremental progress exploring the available evidence. Some climate scientists I’ve chatted to are nervous about exposing more of this messy day-to-day work. They already feel under constant attack, and they feel that allowing the public to peer under the lid (or if you prefer, to see inside the sausage factory) will only diminish people’s respect for the science. I take the opposite view – the more we present the science as a set of nicely polished results, the more potential there is for the credibility of the science to be undermined when people do manage to peek under the lid (e.g. by publishing internal emails). I think it’s vitally important that we work to clear away some of the incorrect mental models people have of how science is (or should be) done, and give people a better appreciation for how our confidence in scientific results slowly emerges from a slow, messy, collaborative process. Giving people a better appreciation of how science is done would also help to overcome some of games of ping pong you get in the media, where each new result in a published paper is presented as a startling new discovery, overturning previous research, and (if you’re in the business of selling newspapers, preferably) overturning an entire field. In fact, it’s normal for new published results to turn out to be wrong, and most of the interesting work in science is in reconciling apparently contradictory findings. This view suggests that scientists respond to a specific policy question by designing and building software models (preferably testing that the model satisfies its specification), and then running the model to answer the question. This is not the only (or even the most common?) layperson’s view of climate modelling, but the point is that there are many incorrect mental models of how climate models are developed and used, and one of the things we should strive to do is to work towards dislodging some of these by doing a better job of explaining the process. The previous version of the model acts as a control, and the modified model is the experimental condition. Although the point of Jakob’s paper is to argue that the modelling and process studies communities don’t currently do enough of this kind of interactions, so there’s room for improvement in how the modelling influences the kinds of process studies needed, and how the results from process studies feed back into model development. So, how else should we be explaining the day-to-day work of climate scientists? I’m attending a workshop this week in which some of the initial results from the Fifth Coupled Model Intercomparison Project (CMIP5) will be presented. CMIP5 will form a key part of the next IPCC assessment report – it’s a coordinated set of experiments on the global climate models built by labs around the world. The experiments include hindcasts to compare model skill on pre-industrial and 20th Century climate, projections into the future for 100 and 300 years, shorter term decadal projections, paleoclimate studies, plus lots of other experiments that probe specific processes in the models. (For more explanation, see the post I wrote on the design of the experiments for CMIP5 back in September). I’ve been looking at some of the data for the past CMIP exercises. CMIP1 originally consisted of one experiment – a control run with fixed forcings. The idea was to compare how each of the models simulates a stable climate. CMIP2 included two experiments, a control run like CMIP1, and a climate change scenario in which CO2 levels were increased by 1% per year. CMIP3 then built on these projects with a much broader set of experiments, and formed a key input to the IPCC Fourth Assessment Report. There was no CMIP4, as the numbers were resynchronised to match the IPCC report numbers (also there was a thing called the Coupled Carbon Cycle Climate Model Intercomparison Project, which was nicknamed C4MIP, so it’s probably just as well! ), so CMIP5 will feed into the fifth assessment report. So here’s what I have found so far on the vital statistics of each project. Feel free to correct my numbers and help me to fill in the gaps! [Update:] I’ve added a row for number of runs, i.e. the sum of the number of experiments run on each model (in CMIP3 and CMIP5, centres were able to pick a subset of the experiments to run, so you can’t just multiply models and experiments to get the number of runs). Also, I ought to calculate the total number of simulated years that represents (If a centre did all the CMIP5 experiments, I figure it would result in at least 12,000 simulated years). Oh, one more datapoint from this week. We came up with an estimate that by 2020, each individual experiment will generate an Exabyte of data. I’ll explain how we got this number once we’ve given the calculations a bit more of a thorough checking over. Our paper on defect density analysis of climate models is now out for review at the journal Geoscientific Model Development (GMD). GMD is an open review / open access journal, which means the review process is publicly available (anyone can see the submitted paper, the reviews it receives during the process, and the authors’ response). If the paper is eventually accepted, the final version will also be freely available. The way this works at GMD is that the paper is first published to Geoscientific Model Development Discussions (GMDD) as an un-reviewed manuscript. The interactive discussion is then open for a fixed period (in this case, 2 months). At that point the editors will make a final accept/reject decision, and, if accepted, the paper is then published to GMD itself. During the interactive discussion period, anyone can post comments on the paper, although in practice, discussion papers often only get comments from the expert reviewers commissioned by the editors. One of the things I enjoy about the peer-review process is that a good, careful review can help improve the final paper immensely. As I’ve never submitted before to a journal that uses an open review process, I’m curious to see how the open reviewing will help – I suspect (and hope!) it will tend to make reviewers more constructive. Abstract. A climate model is an executable theory of the climate; the model encapsulates climatological theories in software so that they can be simulated and their implications investigated. Thus, in order to trust a climate model one must trust that the software it is built from is built correctly. 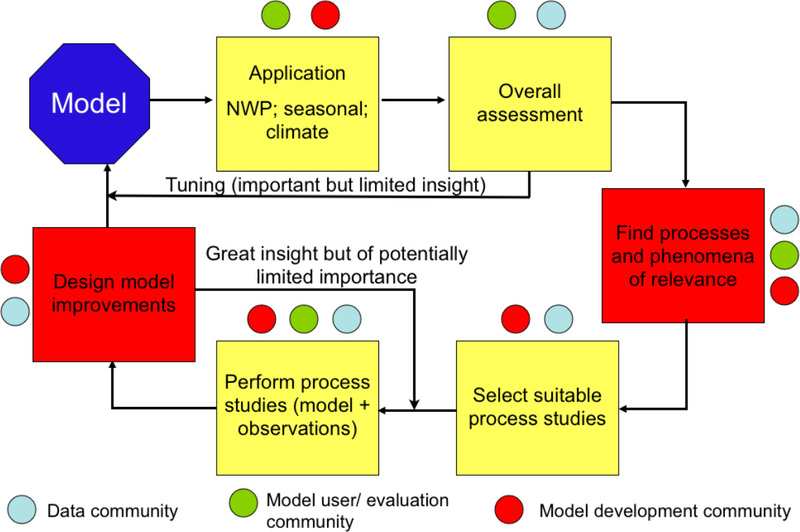 Our study explores the nature of software quality in the context of climate modelling. We performed an analysis of defect reports and defect fixes in several versions of leading global climate models by collecting defect data from bug tracking systems and version control repository comments. We found that the climate models all have very low defect densities compared to well-known, similarly sized open-source projects. We discuss the implications of our findings for the assessment of climate model software trustworthiness. I had several interesting conversations at WCRP11 last week about how different the various climate models are. The question is important because it gives some insight into how much an ensemble of different models captures the uncertainty in climate projections. Several speakers at WCRP suggested we need an international effort to build a new, best of breed climate model. For example, Christian Jakob argued that we need a “Manhattan project” to build a new, more modern climate model, rather than continuing to evolve our old ones (I’ve argued in the past that this is not a viable approach). There have also been calls for a new international climate modeling centre, with the resources to build much larger supercomputing facilities. The counter-argument is that the current diversity in models is important, and re-allocating resources to a single centre would remove this benefit. Currently around 20 or so different labs around the world build their own climate models to participate in the model inter-comparison projects that form a key input to the IPCC assessments. Part of the argument for this diversity of models is that when different models give similar results, that boosts our confidence in those results, and when they give different results, the comparisons provide insights into how well we currently understand and can simulate the climate system. For assessment purposes, the spread of the models is often taken as a proxy for uncertainty, in the absence of any other way of calculating error bars for model projections. But that raises a number of questions. How well do the current set of coupled climate models capture the uncertainty? How different are the models really? Do they all share similar biases? And can we characterize how model intercomparisons feed back into progress in improving the models? I think we’re starting to get interesting answers to the first two of these questions, while the last two are, I think, still unanswered. Scenario uncertainty: the uncertainty over future carbon emissions, land use changes, and other types of anthropogenic forcings. As we really don’t know how these will change year-by-year in the future (irrespective of whether any explicit policy targets are set), it’s hard to say exactly how much climate change we should expect. Model uncertainty: the range of different responses to the same emissions scenario given by different models. Such differences arise, presumably, because we don’t understand all the relevant processes in the climate system perfectly. This is the kind of uncertainty that a large ensemble of different models ought to be able to assess. This analysis shows that for short term (decadal) projections, the internal variability is significant. Finding ways of reducing this (for example by better model initialization from the current state of the climate) is important the kind of near-term regional projections needed by, for example, city planners, and utility and insurance companies, etc. Hawkins & Sutton indicate with dashed lines some potential to reduce this uncertainty for decadal projections through better initialization of the models. For longer term (century) projections, internal variability is dwarfed by scenario uncertainty. However, if we’re clear about the nature of the scenarios used, we can put scenario uncertainty aside and treat model runs as “what-if” explorations – if the emissions follow a particular pathway over the 21st Century, what climate response might we expect? Model uncertainty remains significant over both short and long term projections. The important question here for predicting climate change is how much of this range of different model responses captures the real uncertainties in the science itself. In the analysis above, the variability due to model differences is about 1/4 of the magnitude of the mean temperature rise projected for the end of the century. For example, if a given emissions scenario leads to a model mean of +4°C, the model spread would be about 1°C, yielding a projection of +4±0.5°C. So is that the right size for an error bar on our end-of-century temperature projections? Or, to turn the question around, what is the probability of a surprise – where the climate change turns out to fall outside the range represented by the current model ensemble? Just as importantly, is the model ensemble mean the most likely outcome? Or do the models share certain biases so that the truth is somewhere other than the multi-model mean? Last year, James Annan demolished the idea that the models cluster around the truth, and in a paper with Julia Hargreaves, provides some evidence that the model ensembles do a relatively good job of bracketing the observational data, and, if anything, the ensemble spread is too broad. If the latter point is correct, then the model ensembles over-estimate the uncertainty. There are clearly differences in how the components are coupled together (for example, whether all data exchanges pass through a coupler, or whether components interact directly). In some cases, major subcomponents are embedded as subroutines within a model component, which makes the architecture harder to understand, but may make sense from a scientific point of view, when earth system processes themselves are tightly coupled. However, such differences in the code might just be superficial, as the choice of call structure should not, in principle affect the climatology. The other significant difference is in the relative sizes of the major components. Lines of code isn’t necessarily a reliable measure, but it usually offers a reasonable proxy for the amount of functionality. So a model with an atmosphere model dramatically bigger than the other components indicates a model for which far more work (and hence far more science) has gone into modeling the atmosphere than the other components. Compare for example, the relative sizes of the atmosphere and ocean components for HadGEM3 and IPSLCM5A, which, incidentally, both use the same ocean model, NEMO. HadGEMs has a much bigger atmosphere model, representing more science, or at least many more options for different configurations. In part, this is because the UK Met Office is an operational weather forecasting centre, and the code base is shared between NWP and climate research. Daily use of this model for weather forecasting offers many opportunities to improve the skill of the model (although improvement in skill in short term weather forecasting doesn’t necessarily imply improvements in skill for climate simulations). However, the atmosphere model is the biggest beneficiary of this process, and, in fact, the UK Met Office does not have much expertise in ocean modeling. 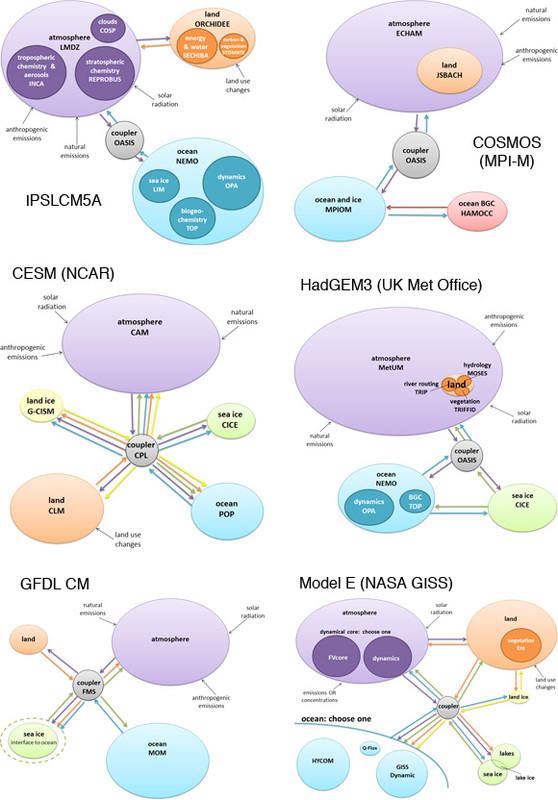 In contrast, the IPSL model is the result of a collaboration between several similarly sized research groups, representing different earth subsystems. In these diagrams, the models from the same lab are coloured the same. Observational data are in pale blue (three observational datasets were included for temperature, and two for precipitation). Some obvious things jump out: the different observational datasets are more similar to each other than they are to any other model, but as a cluster, they don’t look any different from the models. Interestingly, models from the same lab tend to be more similar to one another, even when these span different model generations. For example, for temperature, the UK Met Office models HadCM3 and HadGEM1 are more like each other than they are like any other models, even though they run at very different resolutions, and have different ocean models. For precipitation, all the GISS models cluster together and are quite different from all the other models. 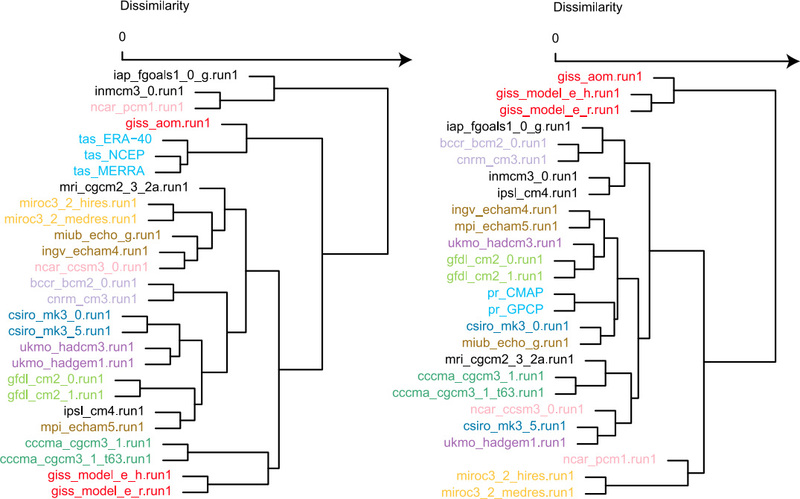 The overall conclusion from this analysis is that using models from just one lab (even in very different configurations, and across model generations) gives you a lot less variability than using models from different labs. Which does suggest that there’s something in the architectural choices made at each lab that leads to a difference in the climatology. In the paper, Masson & Knutti go on to analyze perturbed physics ensembles, and show that the same effect shows up here too. Taking a single model, and systematically varying the parameters used in the model physics still gives you less variability than using models from different labs. There’s another followup question that I would like to analyze: do models that share major components tend to cluster together? There’s a growing tendency for a given component (e.g. an ocean model, an atmosphere model) to show up in more than one lab’s GCM. It’s not yet clear how this affects variability in a multi-model ensemble. So what are the lessons here? First, there is evidence that the use of multi-model ensembles is valuable and important, and that these ensembles capture the uncertainty much better than multiple runs of a single model (no matter how it is perturbed). The evidence suggests that models from different labs are significantly different from one another both scientifically and structurally, and at least part of the explanation for this is that labs tend to have different clusters of expertise across the full range of earth system processes. Studies that compare model results with observational data (E.g. Hargreaves & Annan; Masson & Knutti) show that the observations looks no different from just another member of the multi-model ensemble (or to put it in Annan and Hargreaves’ terms, the truth is statistically indistinguishable from another model in the ensemble). It would appear that the current arrangement of twenty or so different labs competing to build their own models is a remarkably robust approach to capturing the full range of scientific uncertainty with respect to climate processes. And hence it doesn’t make sense to attempt to consolidate this effort into one international lab.